Office Space - Leiston, Suffolk. 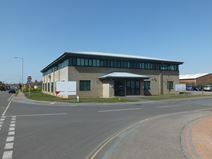 A five-minute drive to Sizewell nuclear power station and a five-minute walk from Leiston Town Centre, these modern light-industrial units and offices are ideal for supply chain companies to, and businesses within, the nuclear power sector. The town offers good amenities, and has fine transport links with easy road access and direct bus services to to the nearby towns of Ipswich, Thorpeness and Aldeburgh.